I love the convenience of shopping online. As a budget conscious consumer I am always searching for the best online deals. SelectAware.com has made it easier than ever to find savings at all of my favorite stores! 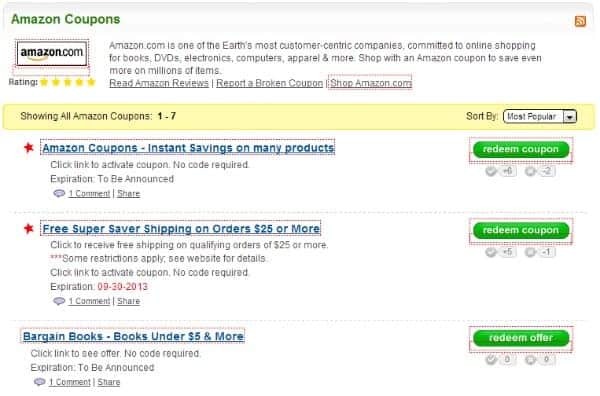 As a busy wife and mother, I also appreciate not having to clip coupons by using SelectAware.com which is “Your Online Coupon Portal”. Every penny that I am able to save will add up to a significant savings over the year. In fact our entire 12 day summer vacation this summer was paid for by money we had saved up over the year by using coupons, promotions and discounts. How can you save time and money by shopping via SelectAware.com? At SelectAware.com you will find free and exclusive online coupons, promo codes and excellent deals for many of your favorite stores. I found this website very easy to navigate and was quite impressed with the wide selection of online stores (over 1,500) including Sears, Apothica, Amazon, Gander Mountain and many more. 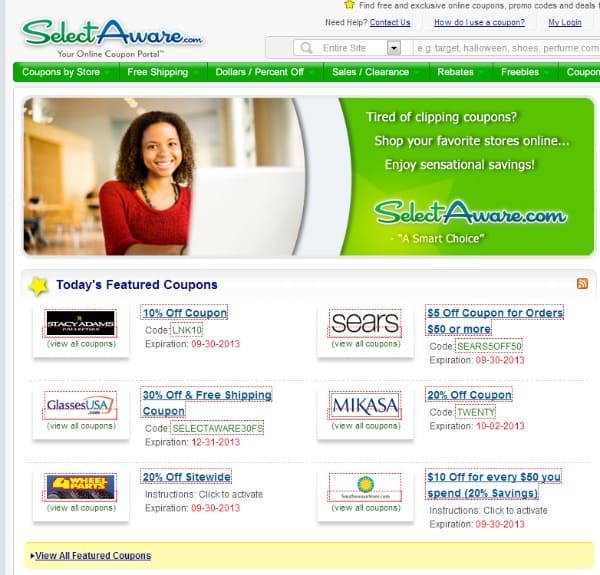 I appreciate that SelectAware.com enables me to quickly find the savings that I am looking for in categories organized by Coupons by Store, Free Shipping, Sales/Clearance, Rebates, Freebies and more. When I shop online, I am always looking to find free shipping options and SelectAware.com makes it easier than ever to score this added savings. I can even search for a specific topic such as Halloween costumes at SelectAware.com and it will bring up all of the stores that match my search……how convenient is that?! A quick search of savings at my favorite stores brought up lots of money saving options. For example, at Hanna Andersson, I found an alert linking me to the online 50% off sale. I also needed to have new business cards printed up for my husband’s business and scored 100 FREE business cards by using the link to connect to Overnight Prints. Finally, I was able to save 20% off my order of $20+ at Costume Discounters…..a great deal! You are invited to visit SelectAware.com to check out all of the wonderful money saving opportunities available. You can even sign up to receive the SelectAware Coupon Savings Newsletter and have a chance to win one of five FREE $25 Amazon.com prizes awarded weekly! 25% of zales! i love jewelry and savings! Mikasa 20% off deal is the one i like most. I didn’t realize how many different coupons they had available at selectaware! I like the 20% Off Coupon for Mikasa. I like the Wholesale Halloween Costumes Clearance Center – Up to 50% Off deal. My favorite deal is the 20% Off Coupon for any Order $100 or more at Kohl’s! I like the ‘ $5 Off Coupon for Orders $25 or more when you sign up for Halloween Express Emails’. Thank you for having this giveaway. My favorite deal is 15% off any order at Kohl’s. Thanks for the giveaway… we like “Free shipping on next purchase from L.L.Bean” ! 20% Off Coupon for Orders $40 or more at Carter’s. I like the 20% Off Coupon for Orders $40 or more at Carter’s. Up to 25% Off and Free Shipping on select HDTVs at Best Buy — excellent deal! That is something I can use since I’m getting a few Xmas presents from that site.